At the end of the first year. As the process evolves, some intermediary objectives need to be addressed urgently. Let’s look at how the ultimate strategy breaks down into strategic points which help to make the most of this process. Dr. Talya N. Bauer, an expert on organizational socialization and Cameron Professor of Management at Portland State University, Oregon, cites scientific data proving that realistic job previews increase the chances of employees’ long-term job commitment by 50%. Today, 93% of all businesses hold orientation of some kind – either in person or online. The objectives of this event are manifold: to provide the new employee with information, complete paperwork, establish social bonds, but primarily – to make them feel welcome and comfortable in their new role. HR specialists recommend having a detailed plan prepared well in advance for the new hire to keep the necessary actions on track. To ensure effective implementation, the plan has to be written, communicated to everyone responsible, consistently applied and tracked over time. Consider employing technology to facilitate the process – especially since a growing number of candidates belong to the millennial generation brought up in the era of social networking and gamification. The first day at work can be difficult for a new hire, so it requires well-tuned organizational cooperation to produce a long-lasting positive impression. The span of the second stage may differ from one role, or company, to another. Some companies, such as IBM, believe that it takes about a month to provide a new hire with all resources needed, clarify the roles and duties, and schedule “check-ins” for measuring their progress. After that, a qualitatively new stage begins – ‘connecting’. It appears that initial enthusiasm and euphoria of landing a new job often gives way to confusion, anxiety and the feeling of inadequacy later on. Experts call this phenomenon ‘new hire fatigue’ and say it is inevitable as a new person exhausts too much energy while learning the ropes. In unfamiliar circumstances, our usual ‘auto-pilot’ mode switches off and every unpredictable complication may cause additional stress. The growing feeling of alienation can be overcome if we ensure proper socialization. During the two months that follow, networking is a priority as it is indispensable in ‘connecting’ with other employees and building up interest communities. One way to engage new employees is to appoint a mentor or a “buddy” that will help bridge both emotional and cognitive gaps. Researchers assign a period of three months for employees to prove themselves in a new position. This benchmark seems to be the pinnacle and crucial point when learning the ropes has come to an end and a novice finally hits the ground running. These qualitative changes can be measured and the chances of a new employee’s success with the organization are estimated accordingly. A 360 feedback report is generally used as a gauge. This metric is employed further on (on a confidential basis with the new hire) after 6 and 12 months with the organization to receive feedback on the role and performance expectations as well as competencies. Self-efficacy: self-confidence in job performance boosts motivation and encourages success. Role-clarity: a clear understanding of a new role and expectations directly impacts revenues. Social integration: ensures better commitment and lower turnover. Awareness of an organizational culture. The fourth aspect is also associated with the degree of satisfaction in the workplace. Learning happens at an individual pace so it’s important at this stage to still allow room for improvement and error. The final transition usually happens after 6 to 12 months with the new organization. 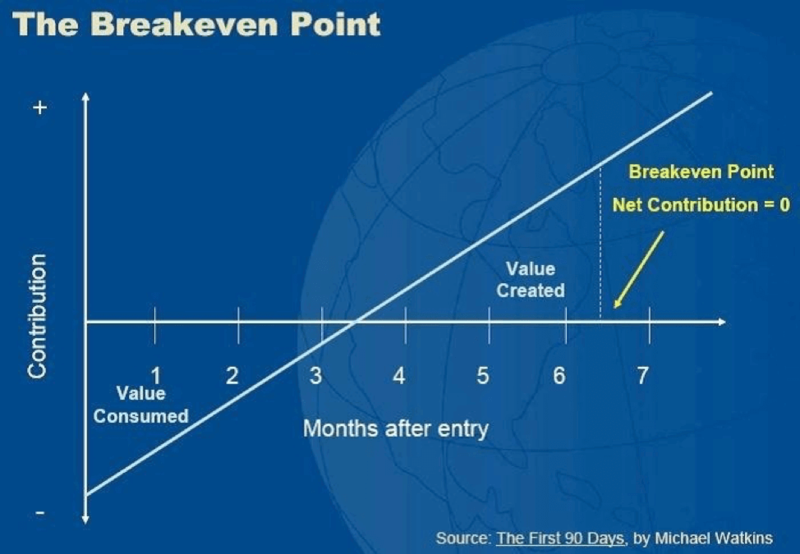 Success is measured by concrete criteria called ‘the breakeven point’. The calculation is a value consumed by the new hire that includes salary and benefits, the cost of training and onboarding as well as the cost of early attrition of successful hires. According to Harvard Business School Professor, Michael Watkins, The First 90 Days do not generate any revenue, and only at the end of this period does a new person actually start adding value. So the real return on investment is seen only within 6-7 months or even later. Andrew Quinn, Director of Training and Development at HubSpot, introduces a notion of baseline viability when estimating salespeople’s successful transition. It comprises core knowledge points as well as core functional skills measured in a variety of ways. and on the job evaluation. As you can see, each stage has its own clear objectives that can be achieved in a variety of ways. There is no universal plan to maximize success, so it always helps to be on the lookout for best practices, inspiring experiences and new trends. 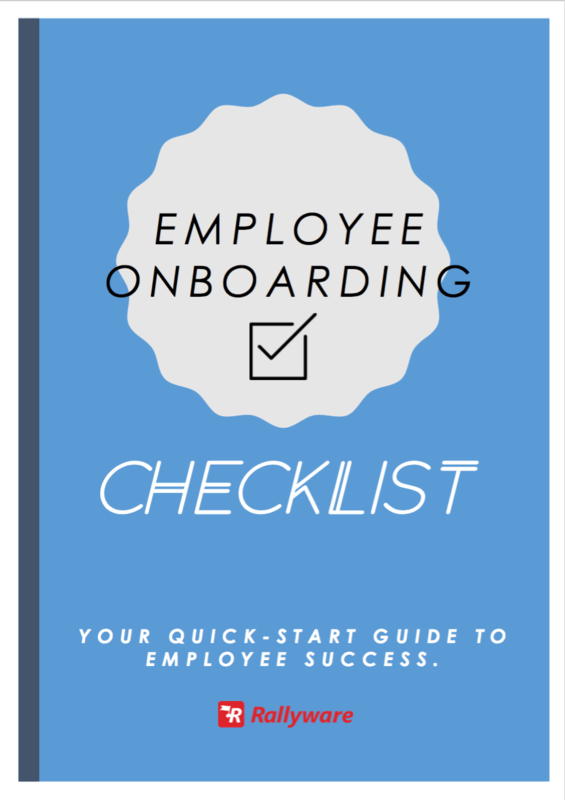 Not sure where to begin with your onboarding program? We can help with that.